The XXth World Jamboree was held during 28 December 2002 to 8 January 2003 at Sattahip, Chonburi Province in Thailand. In commemoration of the 20th World Scout Jamboree and the country's honor as host, the Philatelic department of the Communications Authority of Thailand, has specially produced one million World Scout stamps to be sold at the price of 3 baht and 12 baht. The stamps were sold at post offices throughout the country, including the post offices at the Jamboree site. The stamps were printed in panes of 20 stamps. There are also commemorative cancels for each day of the Jamboree. The 3 baht stamp takes inspiration from the new corporate identity of the World Organization of the Scout Movement (WOSM) and shows images of Scouts from the six Regions of WOSM. 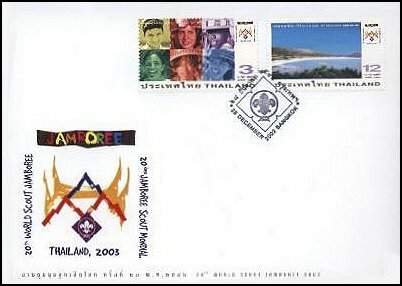 The 12 baht stamp illustrates the camp site of the 20th World Scout Jamboree 2003 located on a beautiful beach at Sattahip district, Chon Buri province. Thailand will also produce First Day Covers, postcards and telephone cards in connection with the World Jamboree.